I dunno, you wait hundreds of years for a herb-flavoured beer, and then two come along at once. Just coincidence, I’m sure, but two new beers (ales, strictly), from the Pilot brewery in Leith, Scotland, and the Ilkley brewery in Yorkshire, have been announced this week that go back to the pre-hop tradition of flavouring your drink with whatever herbs and plants you could find in the local fields, hedgerows and woods, or up on the local moors. I’m delighted to see them, because I love herb-flavoured ales. I have just one worry, as a historian. 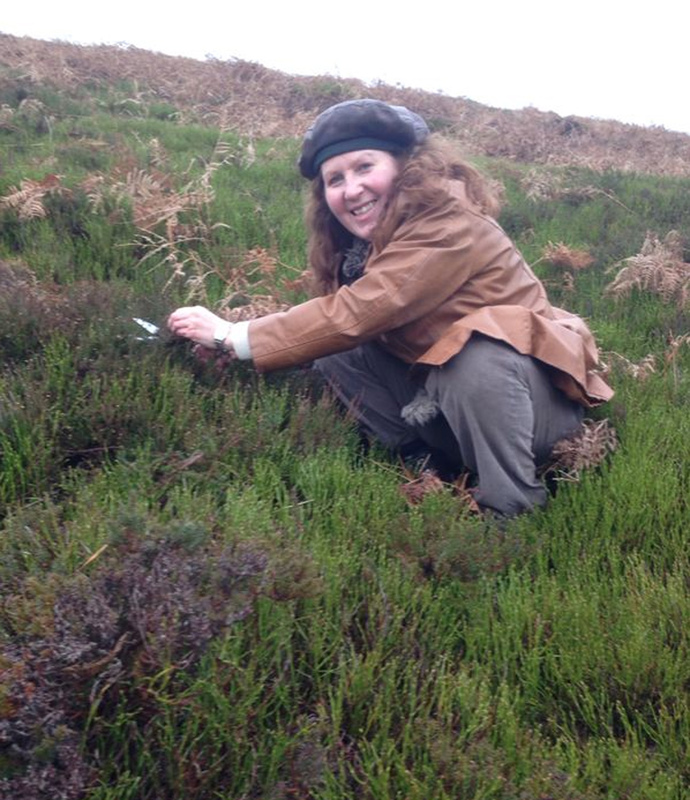 Beer sommelier Jane Peyton supposedly gathering heather for her gruit ale for the Ilkley brewery – except that *ahem* the heather isn’t in bloom and so wouldn’t be that great for brewing with – and she’d need more than could be gathered with a pair of scissors. Indeed, the “gruit” tradition (Grute in German) on the Continent was very different from anything we had in Britain, in that it involved the sale of the herbal flavourings by the state or its representatives to the brewers, as a revenue-gathering exercise. In those areas where this happened, it seems to have been compulsory for brewers to use gruit. In Britain, on the other hand, there is a great deal to suggest that much, if not most medieval ale (using the word in its original sense of “unhopped malt liquor”) was brewed without herbs, as well as without hops: to give just one piece of evidence, in 1483 (the year Richard III seized the throne), London’s ale brewers, who were trying to maintain the difference between (unhopped) ale and (hopped) beer, persuaded the authorities to state that for ale to be brewed in “the good and holesome manner of bruying of ale of old tyme used”, no one should “put in any ale or licour [water] whereof ale shal be made or in the wirkyng and bruying of any maner of ale any hoppes, herbes or other like thing but only licour, malt and yeste.” So: London ale in the Middle Ages – no hops, no herbs. You know you’re a historic beer geek when … well, certainly when you immediately recognise a drawing of the plant bog myrtle on a bottle among the crammed shelves at Utobeer in Borough Market. The name of the beer, Gageleer, from the Flemish word for the bog myrtle or sweet gale bush, gagel, confirmed what I had guessed from my initial glimpse: this was a Belgian brew flavoured with what was probably the most important plant used in pre-hop ales, Myrica gale, the heavily-scented heathland shrub that grows in wetlands throughout the British Isles, called gagellan in Old English, and also known as piment royale in French, Porst in German and pors in the Scandinavian languages.